A group of Union County Adopt-a-Park volunteers cleared litter and debris from the Rahway River last weekend, aided by two kayaks on loan from a helpful passer-by. Union County, NJ— An ambitious group of Union County Adopt-a-Park volunteers spent several hours clearing away a logjam in the Rahway River at Nomahegan Park in Cranford last Saturday afternoon. Helped by a passer-by who loaned two kayaks to the effort, they bagged and removed trash and recyclables from the river and from the surrounding area, too. The cleanup was organized by Union County Adopt-a-Park volunteer and Professor Daniela Shebitz of Kean University. Professor Shebitz, a resident of Cranford, conducts conservation activities in Union County parks through the Adopt-A-Park program. After spotting the logjam, Professor Shebitz contacted the Adopt-a-Park program and organized a group of volunteers. Adopt-a-Park provided the group with gloves and other supplies. While the volunteers were clearing the debris, a nearby resident noticed the activity and returned with two kayaks to help. 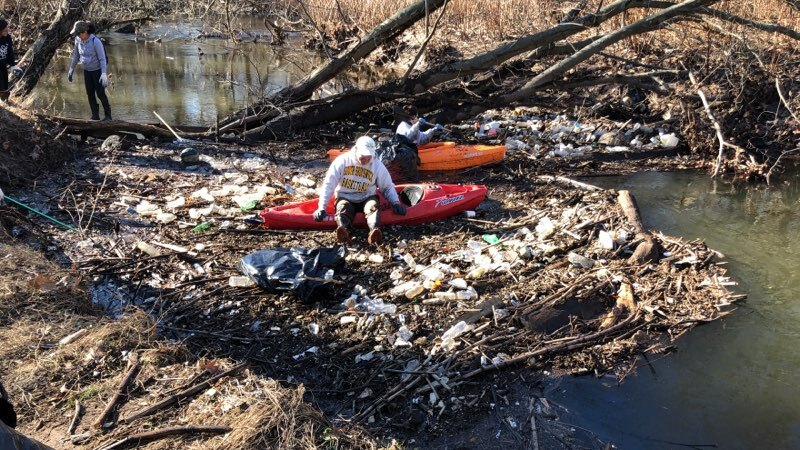 “The kayaks were instrumental in helping the volunteers bag up the debris before it could float farther down the river,” explained Freeholder Chair Kowalski. Trash and recyclables collect in rivers and streams and often get hung up on tree branches, creating a logjam effect. Eventually, the debris finds its way to the ocean and contributes to the growing problem of ocean plastic pollution. Floating bags and other items create hazards for fish and other wildlife that mistake them for food. Residents can help keep plastic and other debris out of waterways in Union County parks by depositing trash and litter in secure containers where it cannot be disturbed by wind or wildlife. To help cut down on plastic waste, residents can carry reusable water bottles, bring reusable bags when shopping, and keep up to date on rules for recycling. Any individual or group is welcome to join Adopt-a-Park. For more information contact the Adopt-a-Park coordinator at 908-789-3683 or visit online at ucnj.org/parks. For all Union County recycling programs and links to local recycling coordinators, visit ucnj.org/recycling.